Learning to ride western style is the least of Ashleigh' worries. When Ashleigh Miller hears about the Pinebark Ridge Western Riding Show, her first reaction is, Cool. Never mind that she doesn't know how to ride Western style. Ash has never been one to back down from a challenge. 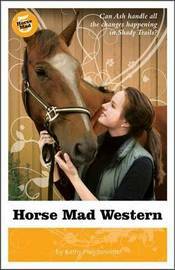 Still, with her job at Shady Trails Riding Ranch, training at the Riding Club, two horses, three best friends, three mortal enemies, a new baby brother, and her parents' bed and breakfast up and running, Ashleigh feels like she's losing control. And just when she thinks that things couldn't be more overwhelming, her boss at Shady Trails asks her to take care of her grandchildren, for two months! Ashleigh can't say no, but Savannah and Mikenzie prove to be more of a handful than their adoring grandmother let on. As Ashley struggles to keep everything together, she must come to grips with the fact that things are changing in Shady Trails, and accepting those changes might be her biggest challenge yet. Kathy Helidoniotis is the author of six books in the Horse Mad series and numerous other books for children. Horse-crazy herself, Helidoniotis divides her time between riding, writing, reading, and teaching.